Fir (Abies spp. ): growing, planting, caring. Scientific name : Abies spp. Abies - Firs - are a genus of about 50 species of evergreen coniferous trees in the family Pinaceae, found through much of North and Central America, Europe, Asia, and North Africa. They are most closely related to the genus Cedrus (cedar). Note that Douglas firs are not true firs, being of the genus Pseudotsuga. They are large trees, reaching heights of 10–80 m (33–262 ft) tall with trunk diameters of 0.5–4 m (1 ft 8 in–13 ft 1 in) when mature. Firs can be distinguished from other members of the pine family by the unique attachment of their needle-like leaves and by their different cones. 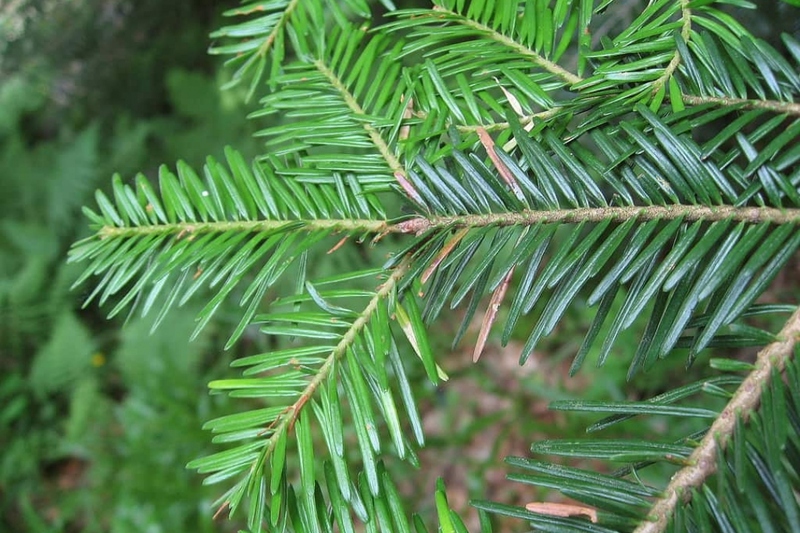 Fir trees are evergreen trees with leaves in the shape of needles. How to distinguish them from other conifers and especially from spruces? First, their cones formed of scales are erected. Secondly, the needles are inserted on the branch by some kind of small "suckers" which are easy to distinguish if one is pulled out. Plant in ordinary soil, not too calcareous, preferably in not too hot areas. Plant preferably in winter, in bare roots or in mound. Dig a hole deep enough, twice as large as the root ball, without mixing the layers of the soil. Plant a solid stake at the bottom of the hole, on the edge, inclined to the prevailing winds. Cut the root hair - the fine roots that looks like hair - to balance the volume of roots and foliage. Plant without burying the boundary between trunk and roots of the tree, putting the soil layers in the same order you removed them. Tamp the soil around the roots with your foot, so you do not leave a pocket of air, and attach the stake to the trunk with a suitable extensible link. Form a hollow in the soil and water abundantly until you fill it. Water regularly and generously for several weeks after planting or sowing, especially if you did it late in the season - in a very dry climate water regularly in the first summer. Do not prune your tree, except in case of force majeure. Conifers naturally let branches that become useless dry, so you can saw these dry branches. To help the fir trees in the early years, it is better to limit the competition of the grass at their base. We advise you to mulch them with dry leaves and shredded branches. Renew once or twice a year.